Learn about the accounting cycle? Learn how to maintain and interpret financial records? Gain the skills you need to work as a bookkeeper or accountant? At Oxbridge Academy, you will have the opportunity to develop your bookkeeping and accounting skills by studying from home via distance learning. Download the Accounting and Bookkeeping brochure here. 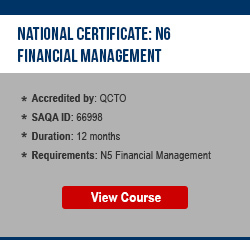 These non-accredited skills courses are designed to equip you with fundamental knowledge and skills in bookkeeping and accounting. These N4 – N6 qualifications are registered on the National Qualifications Framework (NQF). They are formal qualifications designed to prepare you for a successful career in the financial environment. The knowledge and skills that you gain when studying these courses is aligned with the needs of employers in the financial sector. If you have completed your N6 level and can provide evidence of 18 months of relevant practical experience, you may be eligible to apply for – and receive – a National Diploma. Delivery was excellent and the course (Accounting and Bookkeeping) was interesting. People who were at Oxbridge were always helpful and professional. I am glad for the opportunity to study with Oxbridge Academy. I gain so much knowledge on how to work with money and how to budget. How can I benefit from studying bookkeeping and accounting at Oxbridge Academy? You can develop your bookkeeping and accounting skills in your own time from home. You can choose to study a course that suits your professional needs. You will get help from an industry-expert tutor if you need any assistance with your studies. You can pay for your studies in affordable monthly instalments. Bookkeeping and accounting are similar in the sense that they both involve working with financial data, and they both play a role in the accounting cycle. Bookkeeping, however, is only involved in the initial recordkeeping stage of the accounting cycle. Unlike bookkeeping, accounting is divided into specialised branches, including financial accounting, management accounting, tax accounting, and auditing. While in theory there is a clear distinction between bookkeeping and accounting, there is an overlap of the roles of bookkeepers and accountants in practice. In a small organisation, for example, you might find that the bookkeeper is responsible for preparing the financial statements, even though this is technically part of accounting rather than bookkeeping. To carry on reading about the differences between bookkeeping and accounting, click here. Why should I study bookkeeping and accounting? A bookkeeping or accounting course can prepare you for a rewarding career in the financial field. 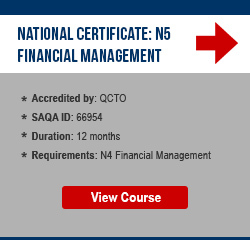 This type of course will also give you a sound understanding of important financial concepts. Whether you plan to pursue a career as a bookkeeper or accountant, or whether you want to work in a managerial role in the business world, having a basic understanding of financial recordkeeping and reporting is essential. Accountants also have the option of furthering their studies and working towards positions such as Company Secretary, Accounting Officer, Chief Financial Officer, or Auditor. To find out more about the various career options that are available in the field of bookkeeping and accounting, click here. Interested in studying a Bookkeeping or Accounting course via distance learning at Oxbridge Academy? Accounting cycle: The process of recording, classifying, and summarising the financial transactions that take place within an organisation. Financial records: Formal documents reflecting financial transactions that have taken place. Examples include invoices, receipts, and financial statements. Journal: Book of original entry for financial transactions. Financial transactions that take place within an organisation are first recorded in a journal – in date order – before being transferred to a ledger account.